Combat documentation/production specialists are the Army's photographers, capturing still images and video to tell the stories of combat and noncombat operations. Soldiers in this job, which is military occupational specialty (MOS) 25V, help create the official record for Army missions and operations, even in situations where the pictures they're taking aren't all that pretty. An affinity for or experience in shooting photos and video is not required for this MOS, but it's certainly helpful. It's also likely people with this kind of background would be inclined toward this sort of work in the Army. These soldiers make video, audio, and still images using electronic and film equipment. This includes cameras, photo scanners, graphic design software, and archiving and editing programs. The media these soldiers produce is used for Army training and operations, public affairs, joint operations, and in-studio missions among the other branches of the military. This job is part of the Army's Signal Corps, which oversees and manages communications for certain Department of Defense functions. They're photographers, IT specialists, cable installers, satellite and microwave specialists, and telecommunications specialists. Combat documentation/production specialists spend the usual ten weeks in Basic Combat Training (also known as boot camp or just "basic") and 12 weeks in Advanced Individual Training (AIT) at Fort Meade in Maryland. If you enlist in this MOS, you'll be trained to use motion picture, audio recording, and other sound equipment, and learn scripting and special effects techniques. 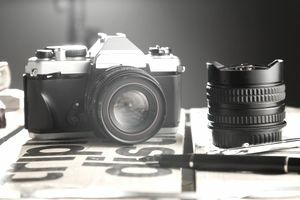 You'll learn about the theory and application of photographic fundamentals, and things such as captioning, chemistry, optics, sensitized materials, light sources, exposing, processing, and printing black and white negatives. The training also includes learning to operate the DVC PRO video camera, a variety of editing systems, audio studios, lighting equipment, the principles of framing and composition, camera placement, audio and video editing, visualization, storytelling, and a working knowledge of audio and video applications for television and studio operations. To be eligible for this Army job, you'll need at least a 93 on the electronics (EL) segment of the Armed Services Vocational Aptitude Battery (ASVAB) tests, and a 91 in the skilled technical (ST) area. There's no Department of Defense security clearance needed for this job, but you need to have normal color vision (so no colorblindness), and you'll be tested to make sure your depth perception meets the Army's binocular vision standards for fine work. Many people who enlist in this job have previous experience or interest in photography and/or videography. But even if you don't, you'll be qualified to pursue jobs in the television, video, or motion picture fields and can find a variety of jobs in photography or radio. What Does an Army Training Cavalry Scout (MOS 19D) Do?